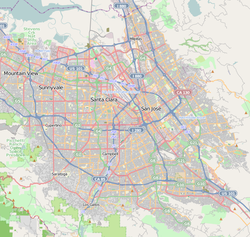 Evergreen is a neighborhood and district of San Jose, California. Evergreen is bounded by Tully Road to the north, Capitol Expressway to the west, San Felipe Road to the south and the East Foothills neighborhood on the eastern edge. The Evergreen branch of the San José Public Library. Evergreen was the site of gliding experiments in 1911 by John J. Montgomery, an important figure in pioneering aeronautics. In his honor the local community has established John J. Montgomery Elementary School, Montgomery Park (City of San Jose). Montgomery's last glider, named "The Evergreen", after the San Jose district, was restored by the Smithsonian Institution and is currently on display at the San Diego Air and Space Museum in San Diego, California. Evergreen is located on the far eastern edge of Santa Clara Valley with the Diablo Range bordering the area to the east. The area is served by Evergreen Elementary School District and East Side Union High School District. Evergreen Valley High School and Silver Creek High School are the primary comprehensive high schools to serve Evergreen. Evergreen Valley College is located near the eastern edge of Evergreen. Evergreen area is served by two libraries as part of San Jose Public Library System: the Evergreen Branch Library on Aborn Road and Village Square Branch Library at the Village Square. ^ "San Jose, CA - Official Website - Montgomery Hill". www.sanjoseca.gov. Retrieved 2017-11-09. ^ "East Side Union High School District - School Boundaries". www.esuhsd.org. Retrieved 2017-11-09. This Santa Clara County, California-related article is a stub. You can help Wikipedia by expanding it. This San Jose, California-related article is a stub. You can help Wikipedia by expanding it. This page was last edited on 29 November 2018, at 20:53 (UTC).